Techniques describing a gradient procedure to separate exosomes from human immunodeficiency virus (HIV) particles are described. This procedure was used to isolate exosomes away from HIV particles in human plasma from HIV-infected individuals. The isolated exosomes were analyzed for cytokine/chemokine content. Konadu, K. A., Huang, M. B., Roth, W., Armstrong, W., Powell, M., Villinger, F., Bond, V. Isolation of Exosomes from the Plasma of HIV-1 Positive Individuals. J. Vis. Exp. (107), e53495, doi:10.3791/53495 (2016). Exosomes are small vesicles ranging in size from 30 nm to 100 nm that are released both constitutively and upon stimulation from a variety of cell types. They are found in a number of biological fluids and are known to carry a variety of proteins, lipids, and nucleic acid molecules. Originally thought to be little more than reservoirs for cellular debris, the roles of exosomes regulating biological processes and in diseases are increasingly appreciated. Several methods have been described for isolating exosomes from cellular culture media and biological fluids. Due to their small size and low density, differential ultracentrifugation and/or ultrafiltration are the most commonly used techniques for exosome isolation. However, plasma of HIV-1 infected individuals contains both exosomes and HIV viral particles, which are similar in size and density. Thus, efficient separation of exosomes from HIV viral particles in human plasma has been a challenge. To address this limitation, we developed a procedure modified from Cantin et. al., 2008 for purification of exosomes from HIV particles in human plasma. Iodixanol velocity gradients were used to separate exosomes from HIV-1 particles in the plasma of HIV-1 positive individuals. Virus particles were identified by p24 ELISA. Exosomes were identified on the basis of exosome markers acetylcholinesterase (AChE), and the CD9, CD63, and CD45 antigens. Our gradient procedure yielded exosome preparations free of virus particles. The efficient purification of exosomes from human plasma enabled us to examine the content of plasma-derived exosomes and to investigate their immune modulatory potential and other biological functions. The HIV-1 epidemic continues to have a significant impact throughout the world. As of 2013, approximately 35 million people worldwide were living with HIV, and 2.1 million of these were newly infected individuals1. Prevention strategies and increased access to antiretroviral therapy have been helpful in reducing the overall acquisition of HIV. However, individual populations are still experiencing rises in the acquisition of HIV1. Thus, there is a need for continued efforts to address this epidemic. One of the strongest predictors of HIV disease progression is chronic immune activation (CIA)2-10. Defined by persistently high levels of detectable cytokines and elevated expression markers on the surface of T lymphocytes, CIA has been attributed to: i) continuous dendritic cell production of Type I IFN11; (ii) direct immune activation driven by HIV proteins Tat, Nef and gp12012; (iii) translocation of bacterial proteins in gut associated immune cells6. However, the exact mechanism(s) underlying chronic, systemic immune activation in HIV infection remain to be fully elucidated. Our research group and others have demonstrated a role of exosomes in HIV pathogenesis15-18. Our group has determined that the Nef protein is excreted from infected cells in exosomes15, and exosomal Nef (exNef) is present in the plasma of HIV-infected individuals at nanogram levels18. We have shown that bystander CD4+ T-cells exposed to exNef resulted in activation-induced cell death dependent on the CXCR4 pathway19, 20. Alternatively, monocyte/macrophages were refractory to exNef-induced apoptosis, but exhibited altered cellular functions and cytokine expression. Most recently, our group has shown exosomes isolated from the plasma of HIV-infected individuals contain a variety of pro-inflammatory cytokines. Further, naïve peripheral blood mononuclear cells exposed to plasma-derived exosomes from HIV-infected patients induced expression of CD38 on naïve and central memory CD4+ and CD8+ T cells. This likely contributes to systemic inflammation and viral propagation via bystander cell activation21, and suggests that exosomes play a significant role in HIV pathogenesis. In investigating the role of exosomes in HIV pathogenesis, one challenge is developing techniques to efficiently separate exosomes from HIV particles while maintaining the exosomal content as well as their functional immune modulatory capability. Several methods have been described for isolating exosomes from cell culture and biological fluids22,23. Because of their small size and low density (exosomes float at a density of 1.15 - 1.19 g/ml), differential ultracentrifugation and/or ultrafiltration are the most commonly used techniques for exosome isolation23. However, HIV-infected cell culture supernatants and patients' plasma contain both exosomes and HIV-1 viral particles. Exosomes and HIV-1 particles are very similar in both size and density. Alternatively, taking advantage of the expression of unique exosomal markers such as CD63, CD45, and CD81, exosomes have been isolated using immunoaffinity capture methods23. This procedure can separate virus from exosomes. However, the drawback of this technique is the tight attachment of antibodies to the purified exosomes, which could interfere with assessment of the immunomodulatory potential of exosomes in culture. To address these limitations, we developed a procedure for purification of exosomes from HIV particles in human plasma modified from Cantin and coworkers22 using Iodixanol velocity gradients. Exosomes were found to segregate in the low-density/upper fractions of iodixanol gradients, whereas virus particles segregated in the high-density/lower fractions. Virus particles were identified by p24 ELISA and exosomes were identified using exosome markers AChE, CD9, CD63, and CD45. The upper low-density fractions collected contained exosomes which were negative for HIV-1 p24 contamination. The efficient purification and separation of exosomes from HIV particles in human plasma allows for accurate examination of the content of exosomes derived from human plasma as well as the investigation of their immune modulatory potential and the diagnostic and prognostic value of exosomes in HIV-1 pathogenesis. A general diagram of the exosome isolation and purification procedure is provided in Figure 1. Whole blood was obtained from healthy volunteer donors and from HIV-positive individuals not receiving antiretroviral theraoy attending the Hope Clinic of Emory University and the Infectious Disease Program of Grady Health System in Atlanta, Georgia. This study was approved by the institutional review boards of Emory University and Morehouse School of Medicine. All persons participating in the study gave written and informed consent. Collect 10 ml of peripheral blood by venipuncture in EDTA blood collection tubes (containing 18 mg potassium EDTA), and gently invert five times to mix. Centrifuge the blood collection tubes at 1,000 x g for 20 min at RT to pellet blood cells. Use a sterile pipette to transfer the plasma fraction (4-5 ml) to a 25 ml conical tube. Dilute the plasma with 10 ml of 1 X PBS. Discard blood cells (red blood cells and white cells, also known as PBMC) in an appropriately marked container for biohazard waste. NOTE: In the case of uninfected donor blood samples, the PBMC can be reserved for further use (see procedure IV.2, below). Store the plasma samples at 4 oC for short term (2-3 days) or at -80 oC for longer term storage. NOTE: Bring any frozen plasma samples to 4 oC before further processing. Centrifuge plasma at 10,000 x g for 30 min at 4 °C to remove cellular debris. Use a sterile serological pipette to transfer the cleared plasma supernatant to a clean 25 ml ultracentrifuge tube. Discard the pellet in the biohazard container. Centrifuge the cleared plasma at 100,000 x g for 2 hr at 4 °C to remove large vesicles. Remove the 100,000 x g supernatant carefully by pipetting, and discard in biohazard waste. Resuspend the 100,000 x g pellet in 1 ml of 1X PBS in a clean tube and incubate at RT for 30 min, swirling gently to dislodge and separate particles. Wash the suspended 100,000 x g exosome/virus pellet by adding 25 ml of PBS. Gently invert the tube five times to mix, then centrifuge again at 100,000 x g for 2 hr at 4 °C. Discard the PBS wash solution in the biohazard waste container. Resuspend the 100,000 x g pellet in 1 ml of 1 X PBS and incubate at RT for 30 min swirling gently to dislodge and dissolve the pellet. NOTE: If it is not possible to proceed directly to the iodixanol gradient step, store the pellet, containing exosomes and virus particles, at 4 °C for 1-2 days until the iodixanol gradient step. Generate 6%-18% velocity gradients of iodixanol using a dual-chamber gradient former apparatus. Prepare 6% and 18% solutions of the iodixanol reagent, supplied as a 60% solution in water, by dilution in PBS. Pipet 5.5 ml of the 18% solution into the stirred chamber, and pipet 5.5 ml of the 6% solution into the reservoir chamber. Turn on the stirrer, open the stopcock, and allow each gradient to flow into a 14 ml ultracentrifuge tube. NOTE: Either use immediately or store prepared gradients O/N at 4 °C prior to use. Carefully layer 1 ml of the exosome/virus solution onto the top of each 11 ml gradient. Centrifuge gradients at 250,000 x g for 2 hr at 4 °C, using a SW40Ti swinging bucket rotor. Label twelve (12) 1.5 ml microcentrifuge tubes. Remove 1.0 ml from the top of the gradient and transfer to tube #1. Transfer the remaining 1ml fractions to tubes 2-12 in sequential order. NOTE: The topmost fraction will thus be #1, the bottom fraction, #12. Store the gradient fractions at 4 °C. The purified exosomes, which should be in the fractions 1-3 at the top of the gradient, are stable for 3-4 weeks when stored at 4 °C. Prepare 100 mM substrate stock by mixing acetylthiocholine iodide 28.9 mg in 1 ml of 1X PBS. Store substrate stock at -20 °C up to 1 month. Prepare 10 mM color indicator stock by mixing benzoic acid 39.6mg and sodium bicarbonate 15 mg in 10 ml of 1X PBS. Store color indicator stock at 4 °C up to two weeks. Prepare assay reagent by mixing 1X PBS, substrate, and color indicator in a ratio of 100:2:5 (for example, 10 ml 1X PBS + 200 μl substrate + 500 μl color indicator). Transfer 50 μl from each 1.5 ml gradient fraction tube (labeled 1-12, from procedure III.3) to the wells of a 96-well microtiter plate. Prepare duplicate wells for each gradient sample. Prepare a set of standards by first making a 2000 μU/ml AChE stock in PBS. Make eleven (11) 2-fold serial dilutions of this stock and add 50 μl of each dilution to a single well of a microtiter plate, so that standard #1 = 2,000 μU/ml, #2 = 1,000 μU/ml, #3 = 500 μU/ml, etc. until #12 = 0.98 μU/ml. The twelve AchE standards will thus occupy a single row of a 96-well assay plate. Add 200 μl of assay reagent mixture to each well and incubate 20 min (in the dark) at RT to allow development of the colored reaction product. Measure AChE activity at a wavelength of 450 nm using a fluorescent microplate reader. NOTE: The percentage of starting material remaining after exosome purification is assessed by AchE assay of the unfractionated plasma. Separate proteins in gradient fractions 1-12 (from procedure 2.1.3) by SDS-PAGE on 4-20% Tris-HCl precast gels at 100V x 1 hr. Transfer proteins in the gel to a nitrocellulose membrane using an electro-blotting transfer cell according to the manufacturer's instructions. Allow the transfers to blot for 12-16 hr (O/N) at 350V. Remove the membrane from the blotting apparatus and wash in Tris-Buffered Saline (TBS) for 5 min. Block with 5% nonfat milk in TTBS (TBS with 0.1% Tween 20) for 1 hr by shaking at RT. Incubate the membrane with primary antibodies specific for exosomes (CD9, CD45, CD63) or HIV-1 capsid protein (p24) in 5% nonfat milk with shaking at 4 °C for 12-16 hr (O/N). Dilutions of primary antibodies for immunoblots range from 1:2,000 -1:5,000. Wash the blot in TTBS for 20 min, followed by incubation with a 1: 2,000 dilution of horseradish peroxidase (HRP)-conjugated to anti-IgG (secondary antibody), in 5% nonfat milk for 1 hr at RT. Wash the blot 3 times with TTBS, 10 min per wash.
Incubate the blot with luminol substrate reagent according to the manufacturer's directions, to generate a chemiluminescent signal from the HRP-labeled proteins Detect the chemiluminescent signal using an electronic imaging system with CCD camera. Save the images as TIFF files which can be viewed in Adobe Photoshop. Perform densitometry analysis of bands using ImageJ software (National Institutes of Health, Bethesda, MD). Prior to the cytokine assay, disrupt immune complexes that are usually present in human plasma by acid dissociation and lyse the exosomes by detergent treatment. Assay both starting plasma samples and purified exosome preparations. To 100 μl of human plasma add 100 μl 0.33 N HCL and incubate at 37 °C for 1 hr. Add 100 μl 0.33 N NaOH to neutralize acid-treated plasma. Add Triton X-100 to both the neutralized plasma and purified exosome samples, to a final concentration of 1%, to cause lysis of exosomes. For this assay (a fluorescent bead-based procedure), use magnetic beads pre-coated with antibodies by the manufacturer. Use a custom-designed panel of anti-human cytokine antibody-coated beads; listed in Table 1. Vortex the antibody-coated magnetic beads from the cytokine assay kit for 30 sec and add 50 μl beads to each well of a 96-well plate to be used in the assay. Prepare a dilution series of standards in plasma standard buffer (both contained in the cytokine assay kit) as described in the instruction manual for the cytokine assay kit, to generate an 8-point standard curve. Add 150 μl of 1X wash buffer (from kit) to each well and wash the beads using a magnetic bead washer, as described in the manual. Add 25 μl plasma assay buffer (from kit) to each well. Add 25 μl of standards and samples to all wells used in the assay. Add 25 μl of plasma sample buffer to negative control wells. Seal and shake the plate at 700 rpm for 60 min at RT and incubate O/N at 4 °C. Add 150 μl of 1X wash buffer to each well and wash the plate (as in step 3.3.4, above). Add 25 μl of detection antibodies into each well, seal and shake plate at 700 rpm for 30 min at RT. Repeat the washing step. Add 50 µl of streptavidin solution (SAPE, from kit) into each well, seal and shake plate at 700 rpm for 30 min at RT. Repeat plate washes as in 3.3.4. Add 120 µl of reading buffer (from kit) into each well and shake on a laboratory tabletop shaker at 700 rpm for 5 min at RT to allow the fluorescent signal to develop. Read plate on the plate reader as per the manufacturer's instructions. In order to account for the amount of exosomes lost during the isolation procedure, use the following equation: [(original reading / plasma volume) x 66.6= adjusted cytokine reading]. Centrifuge 500 ml of fetal bovine serum (FBS) at 100,000 x g for 20 hr at 4 °C to pellet contaminating exosomes and microvesicles. Carefully remove and save the exosome-depleted FBS supernatant. Discard the pellet in the biohazard waste. Combine 20% of the exosome-depleted FBS supernatant with 500 ml of Roswell Park Memorial Institute 1640 (RPMI 1640) medium. Filter the medium through a 0.45 µm membrane filter. Add streptomycin (100 U/ml), penicillin (100 U/ml), L-glutamine (2 mM), HEPES-buffered saline solution (10 µM), and IL-2 (20 U/ml) to the filtered medium. Expose exosomes to donor peripheral blood mononuclear cells (PBMC) obtained from healthy clinic volunteers. Suspend PBMC in prepared culture medium and count the cells using a cell/particle counter (according to the manufacturer's standard method). NOTE: The PBMC are obtained during the plasma preparation described above (step 1.2). Using prepared medium from procedure 4.1.3, co-culture 3.0 x 106 (PBMC) with 1 μg/ml of pooled exosomes from three (3) HIV-1 seropositive or from three (3) HIV-1 seronegative individuals in a total volume of 1 ml in the wells of a 12-well culture plate (with lid). Incubate cultures for 48 hr at 37 °C. Prepare untreated PBMC cultures and cultures treated with Concanavalin A (Con A; 5 µg/ml) to serve as negative and positive controls, respectively, as described above (4.2.2). Incubate all PBMC cultures for 48 hr at 37 °C. Immediately prior to harvesting the cells, prepare dilutions of the following fluorochrome-conjugated monoclonal antibodies: Alexa Fluor 700-labeled anti-CD3 (1:400 dilution), allophycocyanin (APC)/cyanine 7 (Cy7)-labeled anti-CD4 (1:400), peridinin chlorophyll protein complex-labeled anti-CD4 (1:400), V450-labeled anti-CD8 (1:400), biotin-labeled anti-CD45RA (1:1,000), phycoerythrin (PE)/Cy7-labeled anti-CD62L (1:1,000), PE/cyanine 5 (Cy5)-labeled anti-CD38 (1:200), PE-Texas Red-labeled anti-streptavidin (1:2,000), and PE/Cy5-labeled mouse IgG1K isotype control (1:200). After the 48 hr incubation period, harvest the PBMC. Wash PBMC in PBS to remove exosomes and stain the cells by incubation for 1hr at 4 °C with individual fluorochrome-tagged antibodies. Analyze the stained PBMC by flow cytometry to quantify the expression of chemokines (as described 21). Exosomes are efficiently purified from HIV-1 positive human plasma. Isolated exosomes, identified by acetylcholinesterase (AChE) activity, segregated in lower density fractions 1-3 at the top of the iodixanol gradients, whereas virus particles, identified by HIV-1 antigen p24, segregated in the higher-density fractions (10-12, near the bottom). The presence of exosomes was further confirmed by immunoblot identification of exosome markers AChE, CD9, CD45, and CD63, and by electron microscopy (Figure 2). 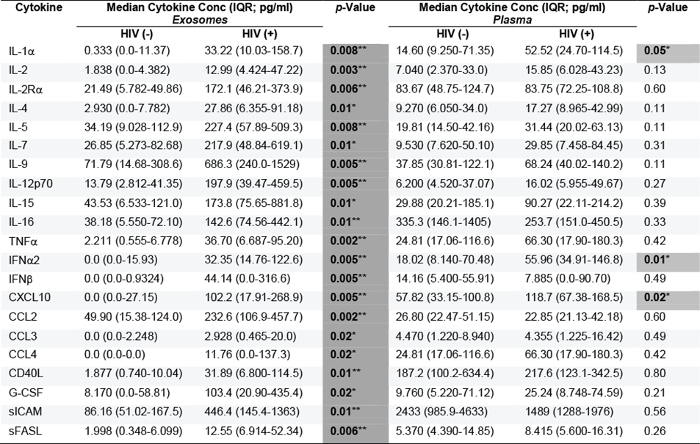 Pro-inflammatory cytokines and chemokines are associated with and significantly elevated in the exosomes of HIV-1 seropositive individuals. Purified exosomes and unfractionated plasma from HIV-1 infected and HIV-1 seronegative individuals were analyzed for 21 cytokines/chemokines by multiplex assay. All 21 cytokines/chemokines were detected in exosomes isolated from HIV-1 positive individuals. Additionally, their levels were significantly elevated as compared to plasma and exosomes from HIV-1 seronegative controls (Table 1). CD38 expression was increased on the surface of cells exposed to exosomes from HIV-1 seropositive individuals. PBMCs from uninfected human donors were exposed for 48 hr to pooled exosomes from HIV-1 seropositive or seronegative individuals and assessed for levels of the activation marker CD38 on CD4+ and CD8+ T-cells via flow cytometry. We observed that by 48 hr post-exposure, CD38 expression on the surface of naïve and central memory CD4+ and CD8+ T cells were significantly elevated in T-cells exposed to exosomes from HIV-1 positive individuals compared to HIV-negative exosome treatment and untreated controls (Figure 3). Figure 1. Schematic representation of exosome isolation from HIV-1 positive human plasma. (A) 10 ml of peripheral blood was collected from HIV-1 seropositve and seronegative individuals. (B) EDTA blood collection tubes were centrifuged at 1,000 x g for 20 min at RT. (C) Separated plasma was transferred to 50 ml conical tubes and diluted ½ with 1x PBS and (D) centrifuged 10,000 x g for 30 min. (E) The supernatant was transferred to ultracentrifuge tubes and (F) centrifuged at 10,000 x g for 2 hr. (G, H) The supernatant was discarded and the exosome pellet re-suspended and washed in 1 ml of 1X PBS. (I) Following centrifugation, the supernatant was discarded and the pellet re-suspended in 1ml 1x PBS and overlaid on 6-18% iodixanol velocity gradient and (J) centrifuged at 250,000 x g for 2 hr. (K) Following centrifugation, 1 ml fractions from top to bottom of the gradient were transferred to 1.5 ml tubes and analyzed for AChE content and immunoblot analysis. (L) Fractions 2 and 3 were than combined and diluted with 4 ml of 1X PBS and (M) centrifuged at 400,000 x g for 2 hr. (N) Following centrifugation, the supernatant was discarded and the pellet re-suspended in 1 ml of 1X PBS for analysis of pro-inflammatory cytokine and chemokine expression. Please click here to view a larger version of this figure. Figure 2. Exosomes are efficiently purified from human plasma. Individual iodixanol velocity gradient fractions from HIV-seropositive or seronegative individuals were subjected to (A) enzymatic assay for acetylcholinesterase (AChE), and (B) Western blot analysis for exosomal markers CD9, CD45, and CD63 and viral protein p24 and were (C) immunolabeled with anti-CD63 and examined with electron microscopy to confirm preparation of purified exosomes (C). (Figure from Konadu et al, 201421, used by permission). Please click here to view a larger version of this figure. Figure 3. Assay for Immunomodulatory Potential. PBMCs from HIV-1 seronegative individuals were exposed to either pooled exosomes from plasma of HIV-1 seropositive (HIV+ Exo) or seronegative (HIV- Exo) individuals, left untreated, or treated with 5 µg/ml of Concanavalin A (Con A) as a positive control. After 48 hr exposure, Naïve (CD45RA+/CD62L+) , Central (TCM; CD45RA-/CD62L+) and Effector (TEM; CD45RA-/CD62L-) memory CD4+ and CD8+ T-cells were analyzed for CD38 expression by flow cytometry. Exosome concentration was normalized by total protein and added at 1 µg/ml. Error bars represent mean +/- SEM of six independent donors. Difference between groups were tested for statistical significance by the One Way ANOVA Test. *p < 0.05, **p< 0.01,***p< 0.001, ****p< 0.0001. (Figure from Konadu et al, 201421,, used by permission). Please click here to view a larger version of this figure. Table 1. Analysis of purified exosomes and whole plasma from HIV-1 seropositive and seronegative individuals for pro-inflammatory cytokine and chemokine expression. Purified exosomes from HIV-1 seropositive or seronegative individuals were analyzed for pro-inflammatory cytokine and chemokine expression. 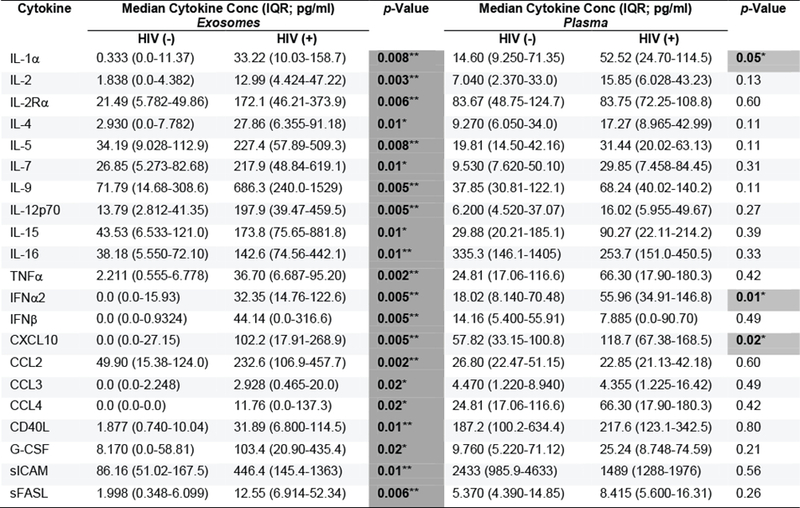 All 21 pro-inflammatory cytokines and chemokines measured were associated with and were significantly elevated in exosomes of HIV-1 seropositive individuals compared to seronegative controls. Additionally, IL-1a, IFNa2, and CXCL10 were significantly elevated in the unfractionated plasma of HIV-1 seropositive individuals compared to seronegative controls. Difference between groups were tested for statistical significance by the Mann-Whitney U Test. *p < 0.05, **p< 0.01,***p< 0.001, ****p< 0.0001. (Figure from Konadu et al, 201421, used by permission). Please click here to view a larger version of this figure. Chronic immune activation (CIA) and CD4+ T cell depletion are two important hallmarks of HIV-1 infection. They have been established as predictors for pathogenesis, with CIA being the best predictor. However, the underlying mechanisms driving chronic systemic immune activation and CD4+ T cell decline still have not been fully elucidated. We and other labs have developed firm evidence that exosomes secreted from HIV-1 infected cells play a role in both hallmarks. The continuing interest in both composition and function of extracellular vesicles has led to the publication of various methods for exosome isolation from both cell culture media and biological fluids24-26. However, a barrier to investigating the role of exosomes in HIV-1 pathogenesis has been the efficient separation of exosomes from HIV-1 particles while maintaining the ability to investigate both exosome content and functional activity. We have developed a protocol for purification of exosomes from HIV-1 particles in human plasma, utilizing iodixanol velocity gradients. The HIV-positive donors used in this study had not received antiretroviral treatment and the plasma samples used for these experiments contained from 1500 to 400,000 virus particles/mL with an average of 206,000 virus particles/ml21. Thus, we demonstrate that exosomes in the plasma of HIV-1 infected individuals can be efficiently separated from HIV-1 virus particles, even when the virus loads are high. Though similar in size and density, exosomes segregated in the low-density/upper fractions of the iodixanol gradients as compared to viral particles, which segregated in the high-density/lower fractions. The exosomes prepared by the iodixanol gradient method are highly purified and free of contaminating extracellular proteins. 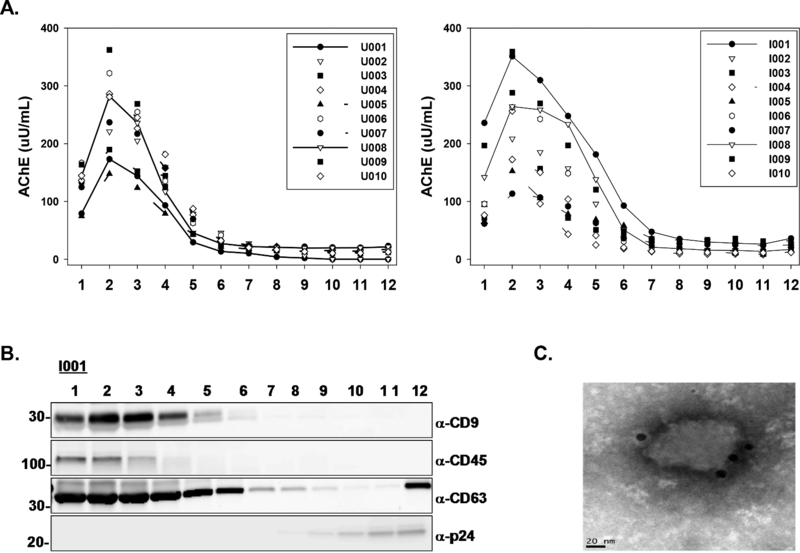 The purity of the isolated exosomes population was confirmed using p24 ELISA and Western blot analysis for HIV-1 p24 capsid protein as well as Western analysis for exosomal markers, AChE, CD9, CD45, and CD63. Use of these markers is consistent with recently published guidelines for exosome identification27. More physiologically relevant to immune activation, the purified exosomes from HIV-1 infected individuals were found to contain cytokines/chemokines at significantly higher concentrations than exosomes from HIV-1 seronegative controls. Moreover, exosomes from HIV-1 infected individuals were biologically active, exhibiting the ability to induce increased levels of the activation marker, CD38, on the surface of naïve and central memory CD4+ and CD8 + T cells. Collectively, these data suggest a mechanism that could drive persistent immune activation during HIV infection. The results we were able to obtain using our exosome purification process, which combines differential centrifugation and iodixanol velocity gradient separation show the value of using highly purified exosomes for physiological and functional bioassays. The procedure does have certain pitfalls and limitations. A considerable amount of the exosomes, often a majority of the starting material as calculated by measurements of AChE activity, are lost during the process. In addition, the procedure is also time consuming and requires access to expensive equipment. Finally, the generation of the iodixanol gradients using the gradient fromer apparatus requires considerable practice to ensure reproducibility. An alternative method for gradient generation might be to prepare a graded series of iodixanol solutions, followed by careful layering of the solutions into centrifuge tubes and incubating O/N to allow the gradients to form. However, we have not tested this alternative. The experimental protocol described here for isolation and separation of exosomes from HIV-1 particles in human plasma is an effective method to ensure the purity of exosomes. Use of this method has led to exciting avenues for future inquiry regarding the role of exosomes in HIV-1 pathogenesis and could equally be used in inquiries for other biological processes. We thank the following people: Jane Chu, Cameron Tran, James Lillard, Mafuz Khan, Masebonang Albert, Ken Rogers, and Syed A. Ali. Kateena Addae-Konadu was supported by UNCF/Merck Graduate Research Fellowship, American Medical Association Foundation, CRECD Grant 8R25MD007589-10, and NIH NIGMS MBRS Grant R25 GM058268. This work was supported by NIMHD grants 8G12MD007602, and 8U54MD007588, NIAID grant 1R21AI095150-01A1, Georgia Research Alliance grant GRA.VAC08.W, and Emory CFAR grant P30 A1050409. Joint United Nations Programme on HIV/AIDS(UNAIDS). UNAIDS Report on the Global AIDS Epidemic. Geneva Switzerland. (2013). Levacher, M., Hulstaert, F., Tallet, S., Ullery, S., Pocidalo, J. J., Bach, B. A. The significance of activation markers on CD8 lymphocytes in human immunodeficiency syndrome: staging and prognostic value. Clin Exp Immun. 90, 376-382 (1992). Giorgi, J. V., Liu, Z., Hultin, L. E., Cumberland, W. G., Hennessey, K., Detels, R. Elevated levels of CD38+ CD8+ T cells in HIV infection add to the prognostic value of low CD4+ T cell levels: results of 6 years of follow-up. The Los Angeles Center, Multicenter AIDS Cohort Study. J Acq Immun Def Synd. 6, 904-912 (1993). Bofill, M., et al. Increased numbers of primed activated CD8+CD38+CD45RO+ T cells predict the decline of CD4+ T cells in HIV-1-infected patients. AIDS. 10, 827-834 (1996). Liu, Z., Cumberland, W. G., Hultin, L. E., Prince, H. E., Detels, R., Giorgi, J. V. Elevated CD38 antigen expression on CD8+ T cells is a stronger marker for the risk of chronic HIV disease progression to AIDS and death in the Multicenter AIDS Cohort Study than CD4+ cell count, soluble immune activation markers, or combinations of HLA-DR and CD38 expression. J Acq Immun Def Synd. 16, 83-92 (1997). Douek, D. C., Roederer, M., Koup, R. A. Emerging concepts in the immunopathogenesis of AIDS. Annu Rev Med. 60, 471-484 (2009). Roberts, L., et al. Plasma cytokine levels during acute HIV-1 infection predict HIV disease progression. AIDS. 24, 819-831 (2010). Mueller, Y. M., et al. Interleukin-15 increases effector memory CD8+ T cells and NK Cells in simian immunodeficiency virus-infected macaques. J Virol. 79, 4877-4885 (2005). Picker, L. J., et al. IL-15 induces CD4 effector memory T cell production and tissue emigration in nonhuman primates. J Clin Invest. 116, 1514-1524 (2006). Mueller, Y. M., et al. IL-15 treatment during acute simian immunodeficiency virus (SIV) infection increases viral set point and accelerates disease progression despite the induction of stronger SIV-specific CD8+ T cell responses. J Immunol. 180, 350-360 (2008). O'Brien, M., Manches, O., Bhardwaj, N. Plasmacytoid dendritic cells in HIV infection. Adv Exp Med Biol. 762, 71-107 (2013). Chihara, T., et al. HIV-1 proteins preferentially activate anti-inflammatory M2-type macrophages. J Immunol. 188, 3620-3627 (2012). Johnstone, R. M., Adam, M., Hammond, J. R., Orr, L., Turbide, C. Vesicle formation during reticulocyte maturation. J Bio Chem. 262, 9412-9420 (1987). Meckes Jr, D. G., Raab-Traub, N. Microvesicles and viral infection. J. Virol. 85, 12844-12854 (2011). Campbell, T. D., Khan, M., Huang, M. B., Bond, V. C., Powell, M. D. HIV-1 Nef protein is secreted into vesicles that can fuse with target cells and virions. Ethn. Dis. 18, (2 Suppl 2), S2-S9 (2008). Muratori, C., et al. Massive Secretion by T Cells Is Caused by HIV Nef in Infected Cells and by Nef Transfer to Bystander Cells. Cell Host. Microbe. 6, 218-230 (2009). Lenassi, M., et al. HIV Nef is Secreted in Exosomes and Triggers Apoptosis in Bystander CD4 T Cells. Traffic. 11, 110-122 (2009). Raymond, A. D., et al. HIV Type 1 Nef Is Released from Infected Cells in CD45+ Microvesicles and Is Present in the Plasma of HIV-Infected Individuals. AIDS Res Hum Retrovir. 27, 167-178 (2011). 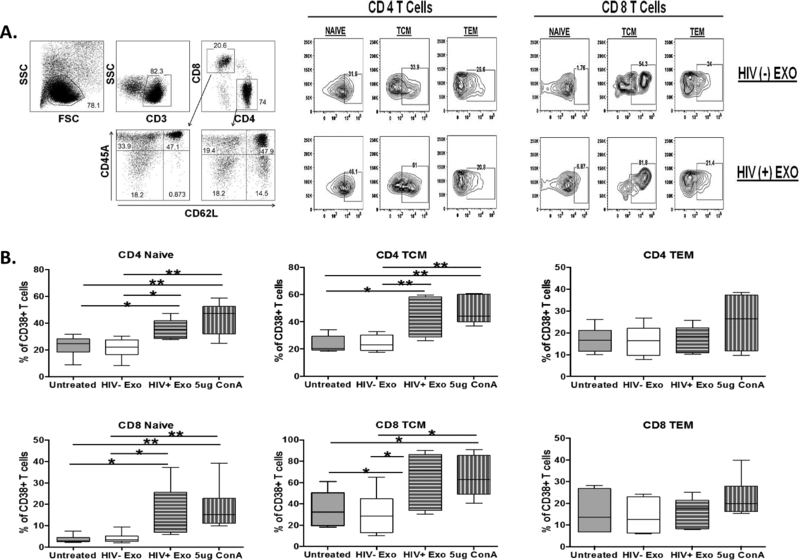 James, C. O., Huang, M. B., Khan, M., Garcia-Barrio, M., Powell, M. D., Bond, V. C. Extracellular Nef Protein Targets CD4+ T Cells for Apoptosis by Interacting with CXCR4 Surface Receptors. Journal of Virology. 78, 3099-3109 (2004). Huang, M. B., Jin, L. L., James, C. O., Khan, M., Powell, M. D., Bond, V. C. Characterization of Nef-CXCR4 Interactions Important for Apoptosis Induction. Journal of Virology. 78, 11084-11096 (2004). Konadu, K. A., et al. Association of cytokines with exosomes in the plasma of HIV-1-seropositive individuals. Journal of Infectious Diseases. (2014). Cantin, R., Diou, J., Belanger, D., Tremblay, A. M., Gilbert, C. Discrimination between exosomes and HIV-1: purification of both vesicles from cell-free supernatants. J Immunol Methods. 338, 21-30 (2008). Witwer, K. W., et al. Standardization of sample collection, isolation and analysis methods in extracellular vesicle research. J Extracellular Vesicles. 2, 20360 (2013). Lässer, C., Eldh, M., Lötvall, J. Isolation and Characterization of RNA-Containing Exosomes. J. Vis. Exp. (59), e3037 (2012). McDonald, M. K., Capasso, K. E., Ajit, S. K. Purification and microRNA Profiling of Exosomes Derived from Blood and Culture Media. J. Vis. Exp. (76), e50294 (2013). Kanchi Ravi, R., Khosroheidari, M., DiStefano, J. K. A Modified Precipitation Method to Isolate Urinary Exosomes. J. Vis. Exp. (95), e51158 (2015). Lötvall, J., et al. Minimal experimental requirements for definition of extracellular vesicles and their functions: a position statement from the International Society for Extracellular Vesicles. J Extracell Vesicles. 3, 26913 (2014).